A report released by Jane's Terrorism and Insurgency Center shows that the majority of the Islamic State's military activities in Syria have focused on non-governmental opposition groups, while only a small percentage have targeted the regime of Syrian president Bashar al-Assad. According to an NBC analysis of the JTIC data, which was gathered from the beginning of 2014 until November 21, approximately 64 percent of IS (commonly called ISIS or ISIL) attacks have targeted opposition parties including Jabhat al-Nusra and the Free Syrian Army–but only 13 percent targeted the Assad regime. Meanwhile in Iraq, more than 50 percent of IS attacks have focused on decimating Iraqi security forces. "In Syria, it's a different situation because you have such a proliferation of competing, non-state armed groups in the country in addition to Assad," JTIC head Matthew Henman said. Henman said both IS and the Assad regime have engaged in the "clever strategy" of "ignoring" one another. In Syria we have a state, not a regime. Let’s agree on the terms first. Second, assuming that what you are saying is true, that we supported ISIS, this means that we have asked this organization to attack us, attack military airports, kill hundreds of soldiers, and occupy cities and villages. Where is the logic in that? What do we gain from it? Dividing and weakening the opposition, as you are saying? We do not need to undermine those elements of the opposition. The West itself is saying that it was a fake opposition. This is what Obama himself said. So, this supposition is wrong, but what is the truth? The truth is that ISIS was created in Iraq in 2006. It was the United States which occupied Iraq, not Syria. Abu Bakr al-Baghdadi was in American prisons, not in Syrian prisons. So, who created ISIS, Syria or the United States? The Assad regime, for its part, has targeted IS militants even less frequently than IS has targeted the Assad regime. The JTIC data shows that during the same period, only six percent of the regime's airstrikes have directly targeted IS. In Aleppo, now an IS stronghold, only 14 percent of airstrikes targeted IS. Even in IS's self-declared "capital" of ar-Raqqa, only half of the airstrikes targeted IS. "Most of the front lines between ISIS and the regime are very quiet—you wouldn't even hear the sound of firing," Yusuf Abu Abdullah, an opposition fighter from the Al-Mujahideen Army, told NBC. "The exact opposite is on our front lines, which are very dangerous and where the fights don't stop for 24 hours." The long game, according to Aleppine IS leader Abu Hafs, is to conquer rebel areas before taking on the Assad regime. 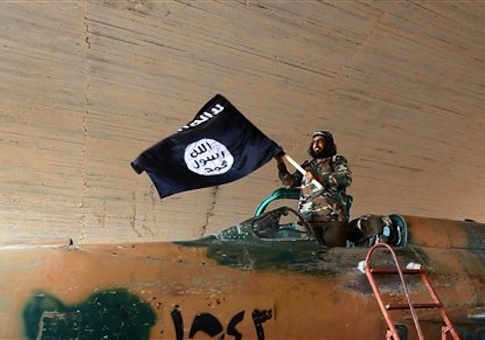 "We are not ignoring the Syrian regime but we are focusing on the rebel areas," Hafs told NBC. "You can't jump to step two. You have to do the first step first. To fight successfully against Bashar Assad's regime, we must first take over the rebel areas." This entry was posted in National Security and tagged Al Qaeda, Bashar al-Assad, Free Syrian Army, Islamic State, Syria. Bookmark the permalink.